Soil compaction is often a problem in field crop production and occurs when soil particles are pressed together, reducing available pore space for air and water. About half the soil volume is composed of particles, the other half is soil pores. At field capacity, these pores are roughly filled to equal parts with water and air. Pores are the spaces where roots grow, microbes live, and water and nutrients move through the soil. For this reason, compaction can lead to poor water infiltration, increased water runoff and soil erosion, restricted root growth, reduced nutrient uptake, and ultimately poor plant growth and lower yields. For example, last spring we visited a dry bean field where there was about an acre of beans along a road that were stunted. When we checked the soil in the affected area, we found it was heavily compacted and root growth was reduced. The areas with healthy plant growth did not show soil compaction problems. Upon talking to the farmer, we learned that the affected area was where water pooled during heavy rains. This was further evidence that there was poor drainage and compacted soil in that part of the field. Soil compaction can occur at the soil surface or in the subsoil. Surface compaction is caused by water hitting tilled soil, which forms a crust. 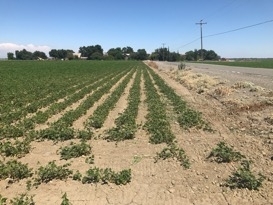 This can be managed by ring-rolling to break the crust and can be avoided by keeping soil covered during the rainy season, either with plant residue or a winter cover crop. This article will focus on subsoil compaction, which is more challenging to manage. Compaction in the subsoil can be in the form of a hardpan layer or deep compaction. A hardpan forms when the tillage implement presses soil directly below it together, forming a compacted layer. Deep compaction occurs further down in the soil profile and is caused by excessive weight on soil, particularly when soil is wet. It can be hard to break up soil once deep compaction occurs. How can soil compaction be avoided? Do not work or drive over soil when wet. Wet soils are much more susceptible to compaction and depth of compaction can increase with soil moisture. Reduce tillage when possible. Tillage breaks up soil aggregates and disrupts soil microbial communities. Vary the depth of tillage to avoid a hardpan layer from forming. Distribute tractor weight over a larger surface tire area by decreasing tire pressure and/or using radial tires. This will reduce the pressure on specific points in the field. Reduce axel load for all machinery. Reduce the number of trips over a field. Do not drive over the field unnecessarily. Incorporate crops with different rooting depths and types into your rotation. Increase soil organic matter with compost, cover crops, or crop residue. Once compaction occurs, it can be very challenging and costly to fix the problem. One can mechanically break up a compacted layer by ripping or chiseling, which will help improve crop growth in the current growing season, but this will not improve soil structure over time. Additionally, if this practice is repeated year after year, compaction will be made worse. Ripping or chiseling should never be done when soil is wet. Good soil aggregation is required to prevent and alleviate soil compaction in the long term. Soil aggregates are clumps of soil particles that are bound together, leaving more available space for air and water. Aggregates are held together by organic matter (like roots), organic compounds (produced by soil microbes), and fungal hyphae. Microbes get nutrients and energy from the carbon found in soil organic matter. This is the reason that increased soil organic matter can make soil more resistant to compaction—it provides food for soil microbes which increases their activity and population. Finally, gypsum can increase water infiltration in soils that are high in sodium (sodic soils) but does not alleviate soil compaction. Sodium ions disrupt the clay structure in soil which causes the clay particles to destabilize and clog available pore space, resulting in slower water infiltration. The calcium in gypsum will replace the sodium in the soil, which helps improve water infiltration. Therefore, gypsum can improve soil structure, but cannot reduce compaction of existing hardpans. Other management practices discussed above need to be implemented to improve and prevent soil compaction problems.